Non-fiction – paperback; Simon & Schuster; 272 pages; 2011. The first time I went to Dubai, on a day trip from neighbouring Abu Dhabi where I was staying in 2009, I couldn’t get over the scale of the place. It was like one giant construction site, with all manner of skyscrapers and shopping malls and apartment blocks being built. And when you went to any of the hotels or shops, there was a real feel of big money and glitz and glamour to the place. But Dubai, one of the seven emirates of the United Arab Emirates (UAE), has a dark underside — or should that be underclass? — of mainly emigrant workers, largely from India and the Phillipines, which the glossy tourist brochures, and the ruling Arab elite, would rather you didn’t know about. Joe Bennett, who is a professional travel writer, comes to grips with both sides of Dubai in this intriguing, and very witty, book based on his time living in the city. His highly readable account explains how Dubai went from being a quiet Arabian port into a hub of global trade and finance in just a matter of decades. Bennett suggests that Dubai is essentially a British creation. That’s because Dubai is a sheikdom, ruled by the “royal” Al Maktoum family, who were never elected into power, they simply “assumed” it with the backing of the British, who, for all kinds of economic reasons, did not wish the UAE to be a democracy. Dubai’s wealth initially lay in oil, but by concentrating on tourism, trade, real estate and financial services, the Al Maktoums have turned it into a Western-style economy. This has meant relaxing many of their rules to attract foreigners and foreign businesses to their shores. For example, up until 2006, the only way a foreigner could live in Dubai was on a limited three-year visa system tied to employment. They could not buy property, because it was all owned by the ruling sheikh and Emiratis. That’s now changed, and expats can purchase their own homes — although judging by the examples Bennett quotes here, it’s not exactly straightforward, nor cheap — but they cannot obtain citizenship. This means they can be told to leave the country at any time, which is quite a convenient system for those in charge. But Bennett doesn’t just look at what makes Dubai tick, he goes out into the other emirates (except the UAE capital, Abu Dhabi) to compare them, and much of what he finds is in stark contrast to the wealth and opportunism that Dubai affords. He meets a variety of people, from expat South Africans living in mansion-like villas equipped with swimming pools and driving expensive four-wheel drives, to hard-working Filipino maids, who are treated like second-class citizens by their employers. He hangs out with foreign businessmen, the nouvea rich, who are making big bucks and plays cricket with Indian, Pakistani and Sri Lankan labourers on their day off. And while he has a perceptive eye and notices the unobtrusive underclass and the lewd, often culturally insensitive, behaviour of the richer expats, Bennett’s book is far from heavy or judgmental. It features some delicious comic moments, such as when he accidentally finds himself caught in no man’s land between the UAE and Oman, or when he falls over in the shower, tears the curtain from the wall and knocks himself out on the toilet seat. This is a terrific book, which pretty much does what it says on the tin. If you’re thinking of visiting Dubai, or even if you’re not, this is a fun, but intelligent, read about a city that is truly unique. Hi, I’ve been eagerly anticipating this review since I first came across your blog. 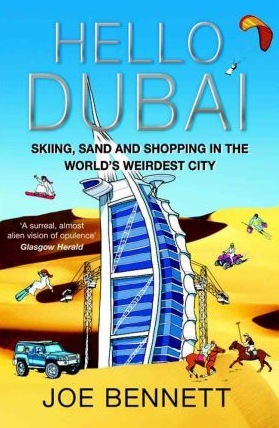 I’ve recently moved to Dubai so am keen to read this one. I’m glad Bennett looks at all aspects of Dubai – it is a three-tier system here between local Emiratis & wealthy Arabs, western expats, and workers from east Asia – but I hope he doesn’t stereotype. Not all westerners here are super rich. Most of us are very ordinary in fact. And some of us are quite nice, down to earth people. Also, not all housemaids are treated badly although it is important to report on the plight of workers here. I think workers’ home governments should do more to warn them of conditions here and to lobby the UAE to improve things. Without migrant workers this place would fall apart and they would be forced to raise wages and standards. Interestingly I can’t get hold of this book here, the powers that be don’t like criticism. I’ll have to buy it in the UK and sneak it here, or buy it on kindle. You should be able to get it there – I bought my copy in Dubai! This sounds intriguing – I don’t know aything about Dubai but I see that the library has a copy so I shall get it out when I next go. That would make more sense kimbofo, there must be loads of people wanting copies here. Where did you buy it? I’ve looked in Borders! Actually I’ll probably get it on Amazon, I’m coming to the UK in August to escape the heat and see the folks. Can’t wait to read it though. I bought mine at the most amazing book store in Dubai Mall, called Kinokuniya. I wrote about it here http://kimbofo.typepad.com/readingmatters/2011/05/a-visit-to-book-world-by-kinokuniya-dubai-uae.html If you visit it, make sure you’ve got a couple of hours spare, if not a whole day: the shop is a little slice of heaven for anyone who loves books. It’s a nice, light read, Verity, even if it does occasionally stray into dark territory. You’ll learn a lot about Dubai (and the UAE), which is a weird mix of East meets West, and shows what it is possible to create if you have so much money you don’t know what to do with it. Ooooh yes, I know the place. My only visit was curtailed by a non-reading husband and 2 non-shopping small children. When I get some time to myself I’ll head down there. I will never get this but I sure want to read this book. It sounds riveting. Thanks for the review- it was great. I had never heard of the book. I’d never heard of it either, Nan. Sometimes the only way to discover great books is to browse in a bookshop, which is why it’s sad so many are closing down. FINALLY got hold of it from the library. I hope you enjoy it, Verity!